I love to run around barefoot but I also dislike having cold feet. I have never found a comfortable pair of slippers that I continuously wear. Actually, now that I think of it, I did but they started to fall apart after a couple of days. I also have a very sensitive sensory and cannot stand rough textures. My oldest things I'm very strange but all my socks have to be extra soft especially if I run. 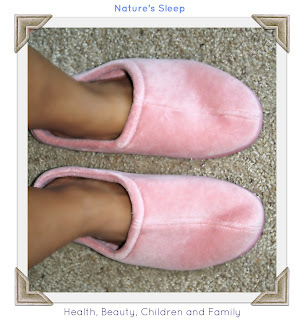 When I first tried on my Nature's Sleep slippers, I was in awe. They are the softest and most comfortable slippers that I have ever tried. They are made of terry cloth and memory foam so as you step, your feet slips down in a cushion of comfort. Other key components include the ability to distribute weight to reduce pressure points and improve circulation. Since they are made with genuine Nature's Sleep Next Generation Memory Foam, they naturally conform to your feet. You can also wear them indoor and outdoors which my dad would love since they carry colors (pale blue, pink and sand) for both men and women. They even come with a 90 day limited warranty. I haven't had to clean them yet but they look like they will hold up well. I definitely love them and recommend them for yourself or as a gift. I still have them on as I am typing this post. My younger ones are envious and want to wear them. I definitely want to try out a pillow and mattress if they are as comfortable and soft as these sleepers. All I can say is ... ahhhh! Nature's Sleep also carries mattresses, pillows, toppers, pet beds and foundations and frames. They are a global manufacturer and distributor of specialty sleep products. They also relay on sustainable practices that help to protect the earth's natural resources. One reader will win their own choice of Nature's Sleep Slippers. *Disclosure: I received a complimentary pair of Nature's Sleep Slippers in exchange for my honest opinion. The product, information and giveaway were provided by Nature's Sleep.